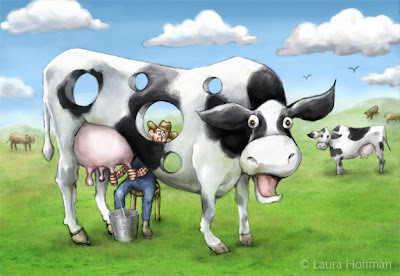 Laura Hoffman Illustration & Design: Holy Cow! I love working out images for idioms, illustrating what a play in words looks like to me. So there's that outburst, "Holy s**t!" that is best said in a more polite way. Saying "Holy Cow!" is a good substitute. A lot of people say this when in awe of something, or if you drop a hammer on a foot. I find myself saying, "Holy Cow" more than most people. So here is another explanation I painted for Holy Cow - or Holey Cow, in my Idiom series. 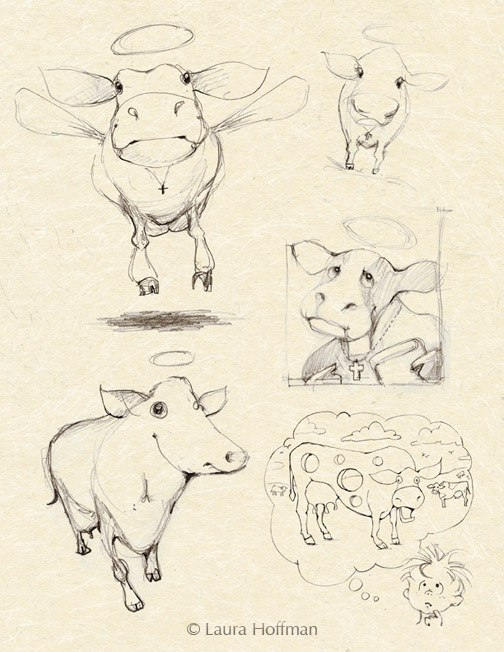 Here are the sketches as I worked on what a "Holy Cow!" really looks like. I enjoyed this post. Also, I shared it with a few of my ESL students, who are Korean. Thank Hal for sharing this post. I love that expression instead of speaking bad word.